After Eater LA last Monday announced Ben Bailly's departure from Petrossian, the chef himself confirmed it via Twitter, but wouldn't say where he was going. Now we know. 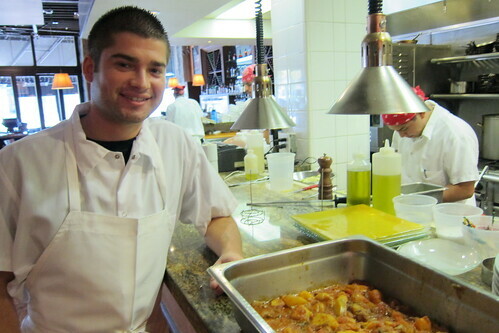 Bailly, who cooked his last meal at Petrossian on Friday, cooked his first meal as executive chef of the Culver City Fraîche on Sunday. The upscale restaurant known for its rustic French and Italian fare is about to undergo a big change, both in menu and atmosphere. "We want to bring in a younger crowd, make it more fun, more casual, more of an everyday place," Bailly says. 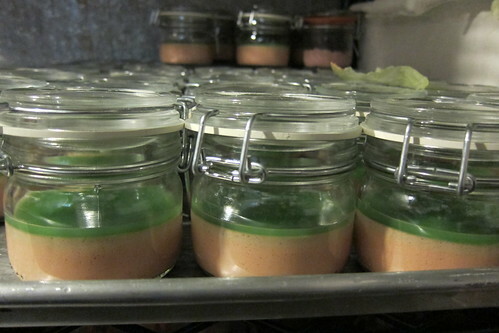 The French-born chef has added a slew of house-made potted meats to the menu including duck rillette, smoked trout and chicken liver parfait with green apple jelly. 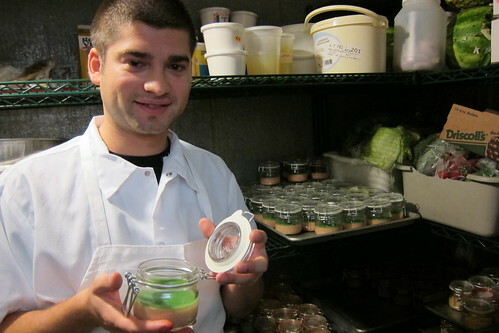 (Not to be confused with pâté, the parfait is made with cream and eggs and cooked slowly to mellow the fowl's flavor). His take on traditional pimento cheese uses manchego, chorizo and piquillo peppers instead of cheddar, bacon and pimentos. Bailly will still offer his much loved mac 'n cheese ($10), and fans of his $18 truffle burger at Petrossian can find a smaller version at Fraiche for $12. For larger dishes ($20-22), he's added duck confit, bavette a l'echalote (a traditional French bistro steak with a caramelized shallot fondue) and skate wing Grenobloise made with capers, sherry vinegar, brown butter and croutons -- something he occasionally served as a special at Petrossian. For the first time, Fraîche will also be open for brunch, dishing up pannetone French toast, pork belly hash and a brioche eggs Benedict. Bailly, who had been with Petrossian since their West Hollywood reopening in May 2009, says that "everything is made fresh, in-house. There are no old dishes. Even the pastas, I changed the recipes."